JOKIC, I. , DELIC, V. , JOKIC, S. , PERIC, Z. Accuracy of an automatic speaker recognition system predominantly depends on speaker models and features that are used. An influence of the shape of auditory critical bands and a contribution of individual components of MFCC-based feature vectors are investigated in the paper and some experimental results are presented and showed their impact on the accuracy of automatic speaker recognition. The speaker-discrimination capability of the MFCCs was experimentally determined by comparing training and test models for the same speaker. The experiments are conducted with three speech databases and showed that 0th and 19th (the last one) MFCCs are non speaker discriminative. The values of MFCCs are determined by the type of applied auditory critical band. The exponential auditory critical bands based on the lower part of exponential function have outperformed the speaker recognition accuracy of other auditory critical bands such as rectangular or triangular shape. F. de Leon, K. Martinez, "Enhancing timbre model using MFCC and its time derivatives for music similarity estimation," in Proc. 20th European Signal Processing Conference (EUSIPCO 2012), Bucharest, Romania, August 27 - 31, 2012, pp. 2005-2009. T. Kinnunen, H. Li, "An overview of text-independent speaker recognition: From features to supervectors," Speech Communication, vol. 52, no. 1, pp. 12-40, 2010. F. Bimbot, J.-F. Bonastre, C. Fredouille, G. Gravier, I. Magrin-Chagnolleau, S. Meignier, T. Merlin, J. Ortega-Garcia, D. Petrovska-Delacretaz, and D. A. Reynolds, "A Tutorial on Text-Independent Speaker Verification," EURASIP Journal on Applied Signal Processing 2004:4, pp. 430-451, 2004. J. P. Campbell, Jr., "Speaker recognition: a tutorial," Proceedings of the IEEE, Vol. 85, No. 9, pp. 1437-1462, 1997. M. M. Dobrovic, V. D. Delic, N. M. Jakovljevic, I. D. Jokic, "Comparison of the Automatic Speaker Recognition Performance over Standard Features," in Proc. of the 2012 IEEE 10th Jubilee International Symposium on Intelligent Systems and Informatics (SISY 2012), Subotica, Serbia, 20 - 22 September 2012, pp. 341 - 344. V. Tiwari, "MFCC and its applications in speaker recognition," International Journal on Emerging Technologies, vol. 1(1), pp. 19-22, 2010. C. Ittichaichareon, S. Suksri, and T. Yingthawornsuk, "Speech Recognition using MFCC," in Proc. International Conference on Computer Graphics, Simulation and Modeling (ICGSM'2012), July 28-29, 2012 Pattaya (Thailand), pp. 135-138. S. D. Dhingra, G. Nijhawan, P. Pandit, "Isolated speech recognition using MFCC and DTW," International Journal of Advanced Research in Electrical, Electronics and Instrumentation Engineering, Vol. 2, Issue 8, August 2013, pp. 4085-4092. D. Neiberg, K. Elenius and K. Laskowski, "Emotion Recognition in Spontaneous Speech Using GMMs," in INTERSPEECH 2006 - ICSLP, 17-21 September 2006, Pittsburg, Pennsylvania, pp. 809-812. B. Panda, D. Padhi, K. Dash, Prof. S. Mohanty, "Use of SVM Classifier & MFCC in Speech Emotion Recognition System," International Journal of Advanced Research in Computer Science and Software Engineering, Volume 2, Issue 3, March 2012, pp. 225-230. Y. Attabi, M. J. Alam, P. Dumouchel, P. Kenny, D. O'Shaughnessy, "Multiple windowed spectral features for emotion recognition," Published in 2013 IEEE International Conference on Acoustics, Speech and Signal Processing (ICASSP), 26-31 May 2013, Vancouver, BC, pp. 7527-7531. D. Wu, B. Li, and H. Jiang, "Normalization and Transformation Techniques for Robust Speaker Recognition," Source: Speech Recognition, Technologies and Applications, Book edited by: France Mihelic and Janez Zibert, ISBN 987-953-7619-29-9, pp. 550, 311-330, November 2008, I-Tech, Vienna, Austria. 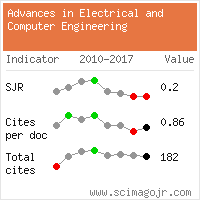 I. Jokic, S. Jokic, Z. Peric, M. Gnjatovic, V. Delic, "Influence of the Number of Principal Components used to the Automatic Speaker Recognition Accuracy," Electronics and Electrical Engineering, Kaunas: Technologija, 2012, No. 7(123), pp. 83-86. B. Salna, J. Kamarauskas, "Evaluation of Effectiveness of Different Methods in Speaker Recognition," Electronics and Electrical Engineering, Kaunas: Technologija, 2010, No. 2(98), pp. 67-70. S. Molau, M. Pitz, R. Schlüter, and H. Ney, "Computing Mel-Frequency Cepstral Coefficients on the Power Spectrum," in Proc. International Conference on Acoustic, Speech and Signal Processing, Salt Lake City, UT, June 2001, Vol. 1, pp. 73-76. C. Lee, D. Hyun, E. Choi, J. Go, and C. Lee, "Optimizing Feature Extraction for Speech Recognition," IEEE Transactions on Speech and Audio Processing, Vol. 11, No. 1, January 2003, pp. 80-87. R. F. Lyon, A. G. Katsiamis, E. M. Drakakis, "History and Future of Auditory Filter Models," Proceedings of 2010 IEEE International Symposium on Circuits and Systems (ISCAS 2010), May 30 - June 2 2010, Paris, France, pp. 3809-3812. 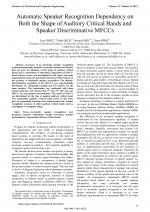 M. Siafarikas, T. Ganchev, N. Fakotakis, G. Kokkinakis, "Wavelet Packet Approximation of Critical Bands for Speaker Verification," International Journal of Speech Technology, ISSN 1381 - 2416, vol.10, no.4, 2007, Springer, pp. 197-218. A. C. den Brinker, "An interpretation of the auditory critical bands using a local Kautz transformation," in Proc. ProRISC 8th anual Workshop on Circuits, Systems and Signal Processing, Mierlo, The Netherlands, 27-28 Nov. 1997, pp. 83-88. B. R. Wildermoth, "Text-Independent Speaker Recognition Using Source Based Features," pp. 19-20, M. Phil. Thesis, Griffith University, Brisbane, Australia, January 2001. F. Cummins, M. Grimaldi, T. Leonard, and J. Simko, "The CHAINS speech corpus: CHaracterizing INdividual Speakers," in Proc. of SPECOM, 2006, pp. 1-6. Citations for references updated on 2019-04-22 11:20 in 71 seconds. Website conception, design and maintenance by Eugen COCA. Content updated on 28 Feb 2019. Site engine updated on 28 Feb 2019. This page was generated on the server in 0.119 seconds and loaded in your browser in > seconds.